It is a century since the death of John William Waterhouse (1849–1917), one of the last major artists to paint mainly in Pre-Raphaelite style. In this and the next article, I consider his career and a selection of his paintings. Waterhouse – who, like Turner, is known by the initials of his first names – was born to an artistic family then living in Rome, just at the dawn of the Pre-Raphaelite Brotherhood. He was quickly nicknamed Nino, an abbreviation for Giovannino or ‘little John’, which he used for the rest of his life; strangely he is not known by this now. Soon after his baptism in April 1849, the family fled from the French siege of Rome, and lived in the Alban Hills, near Frascati. When he was five years old, the family returned to live in Kensington, London, but within two years his mother died of tuberculosis. In the late 1860s, he started drawing in the British Museum, and progressed quickly to watercolour and oil painting. Waterhouse was accepted as a student in sculpture at the Royal Academy Schools in January 1871, at the age of twenty-two, although he seems to have attended little instruction there, and gradually drifted into painting. He first exhibited in 1872, when three of his paintings were accepted by the Society of British Artists, and he continued to exhibit with them until 1875. In 1873, he started exhibiting at the Dudley Gallery, which was popular with those associated with the Pre-Raphaelite movement. John William Waterhouse (1849–1917), Sleep and His Half Brother Death (1874), oil on canvas, 69.9 × 90.8 cm, Private collection. Wikimedia Commons. His first success at the Royal Academy was Sleep and His Half Brother Death, which was exhibited in 1874, and received favourable reviews. 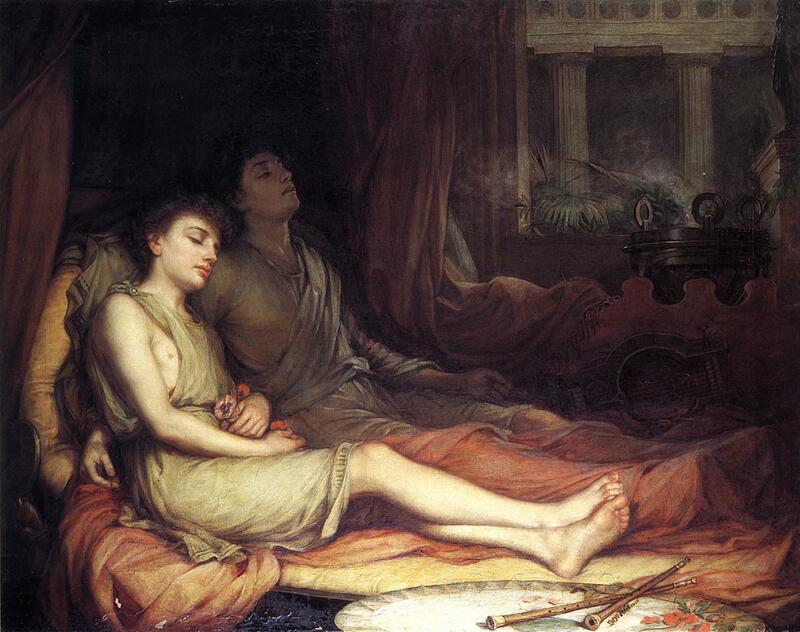 This shows the Greek personification of sleep, Hypnos, and Thanatos, the personification of death. Although a painting with a mythical theme, it appears to have been influenced by the Aesthetic Movement, which was becoming popular with the decline of Pre-Raphaelite principles. Waterhouse then became visibly influenced by the classical subjects of Alma-Tadema, and in 1877 returned to Rome for a period probably lasting a few months. The following year he was earning enough to buy the leasehold of a studio at Primrose Hill in London, where he worked until 1900. 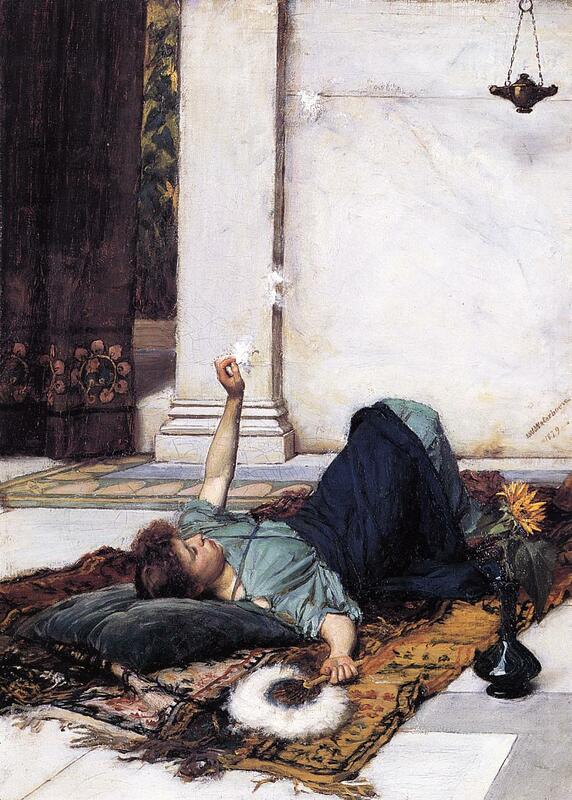 John William Waterhouse (1849–1917), Dolce Far Niente (The White Feather Fan) (1879), oil on canvas, 49.6 x 36.2 cm, Private collection. Wikimedia Commons. His aesthetic tendencies are shown well in two paintings titled Dolce Far Niente, or ‘doing sweet nothing’, which he made in consecutive years. However, he continued to paint more classical themes over this period too. 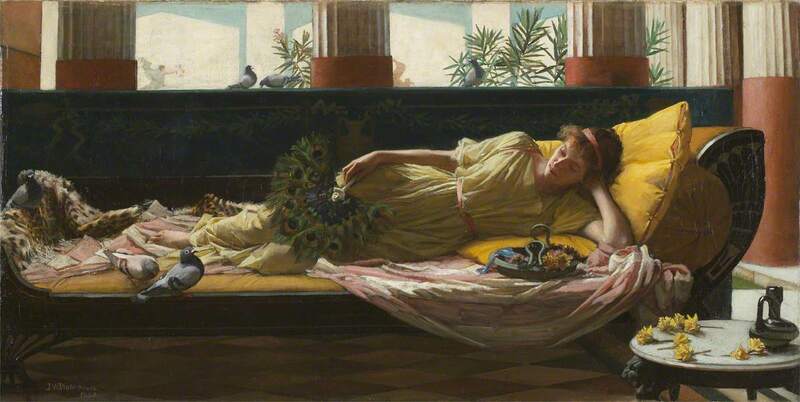 John William Waterhouse (1849–1917), Dolce Far Niente (1880), oil on canvas, 97 × 50 cm, Kirkcaldy Museum and Art Gallery, Kirkcaldy, Fife, Scotland. The Athenaeum. 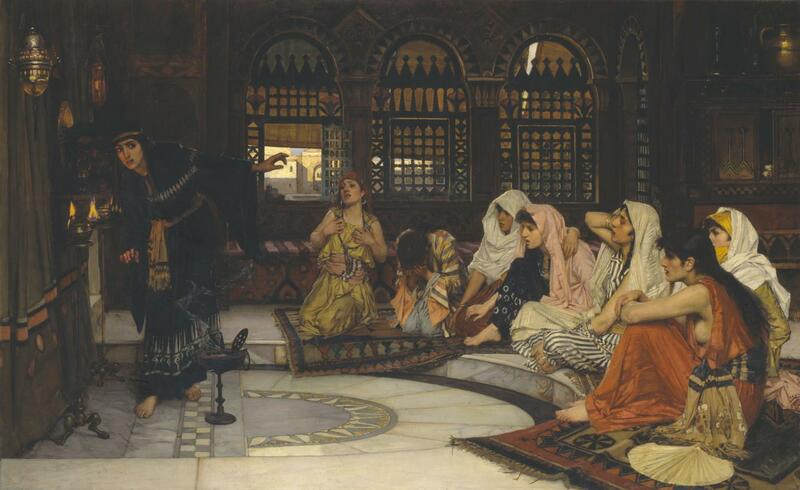 Consulting the Oracle (1884) shows seven girls, sitting in a semi-circle around a priestess at her shrine, awaiting her pronouncement with rising emotion. She puts her ear to the embalmed head which is the oracle itself, so that she can hear its words and interpret them to the girls. This painting was exhibited at the Royal Academy, where it was sold to Sir Henry Tate, who presented it in his bequest which founded the Tate Gallery. It was also pictured in the Illustrated London News at the time. From 1882, Waterhouse is believed to have visited Venice on several occasions, where he painted watercolour scenes which are little-known today, and the following year he married Esther Kenworthy, who had modest success in her floral painting. In the mid 1880s, Waterhouse started to experiment with looser handling, inspired by the work of Jules Bastien-Lepage. This first became evident in The Magic Circle (1886), and became progressively more frequent and more noticeable in later work. 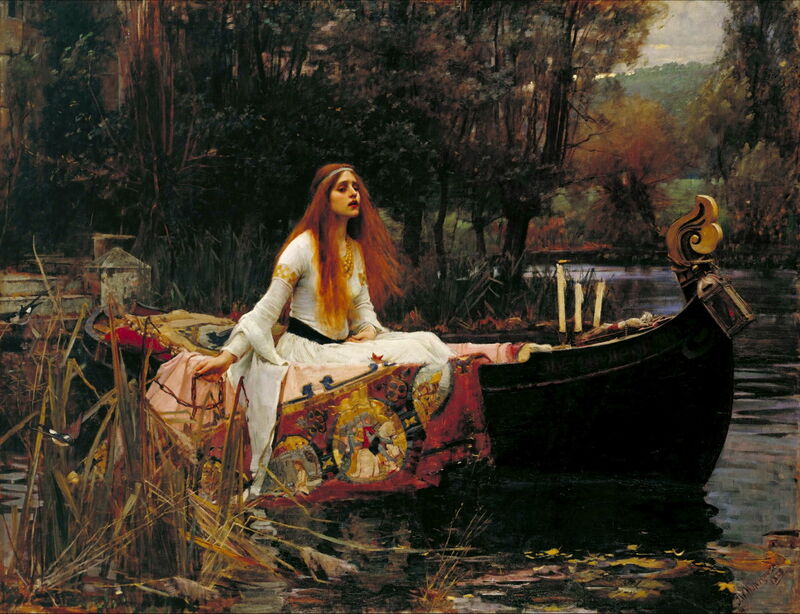 The Lady of Shalott (1888) is the first of his three paintings based on Tennyson’s very popular poem. Condemned to sit weaving and never look directly at the outside world for fear of death, this shows the climax, in which the Lady has abandoned her weaving and castle. She finds a boat on which she writes her name, then floats downriver towards Camelot and the knight Lancelot, dying in the process. Waterhouse exhibited this painting at the Royal Academy in 1888, where it was bought by Sir Henry Tate, despite some rather negative reviews. The following year he painted his first version of another theme which was to become recurrent, that of Ophelia in Shakespeare’s Hamlet. 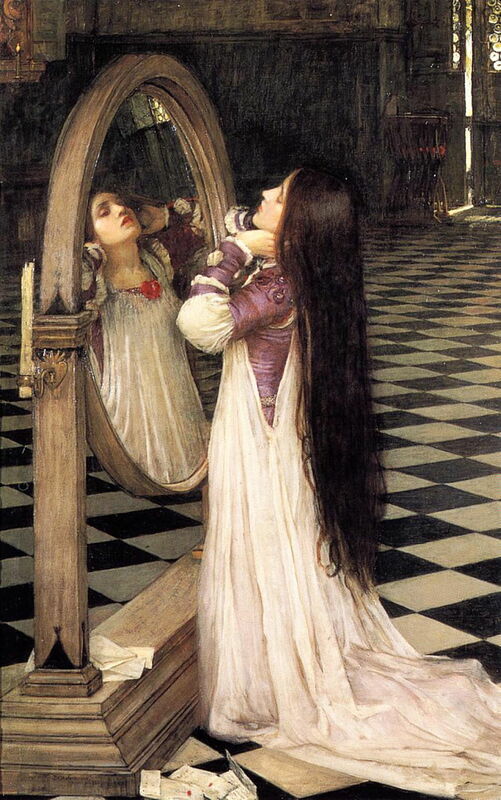 By the late 1880s, Waterhouse’s work was becoming sought-after. Dealers such as Agnew’s were prepared to pay substantial sums, and Waterhouse clearly achieved financial security as a result. John William Waterhouse (1849–1917), Ulysses and the Sirens (1891), oil on canvas, 100.6 x 201.7 cm, National Gallery of Victoria, Melbourne, Australia. Wikimedia Commons. His main work submitted to the Royal Academy for exhibition in 1891 was Ulysses and the Sirens, which is one of his finest narrative paintings. Taken from Homer’s Odyssey, it shows the Sirens trying to lure Odysseus and his crew to their deaths. Odysseus has had himself lashed to the mast so that he is unable to to command the vessel, and his crew have plugged their ears with beeswax and wrapped cloth around their heads to ensure that they cannot hear the Sirens’ alluring song. This painting was bought, on the advice of Herkomer, for the public collection of the National Gallery of Victoria at Melbourne, Australia. John William Waterhouse (1849–1917), Circe Offering the Cup to Odysseus (1891), oil on canvas, 149 x 92 cm, Gallery Oldham, Manchester, England. Wikimedia Commons. Astonishingly, he also exhibited a second major mythical painting, Circe Offering the Cup to Odysseus, at the newly-opened New Gallery in London that year. The story here is drawn from the Odyssey, in which Circe is offering Odysseus her enchanted cup containing wine laced with magical potion. As with others in his crew, Odysseus is transformed into a pig. 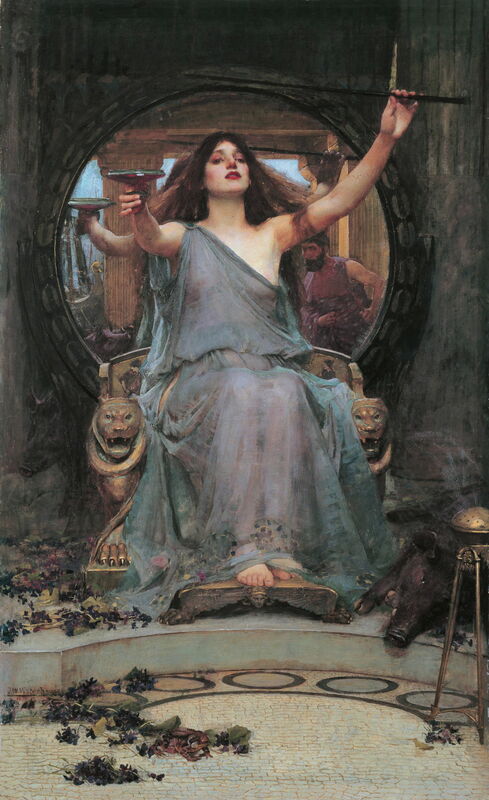 The ingenious use of a mirror to show Odysseus ensures that Circe’s invitation is extended to the viewer too, who cannot escape her alluring gaze. This painting sold quickly to Charles Lee, a wealthy cotton mill owner from Oldham in Lancashire. In 1895, Waterhouse was finally elected a full Academician. 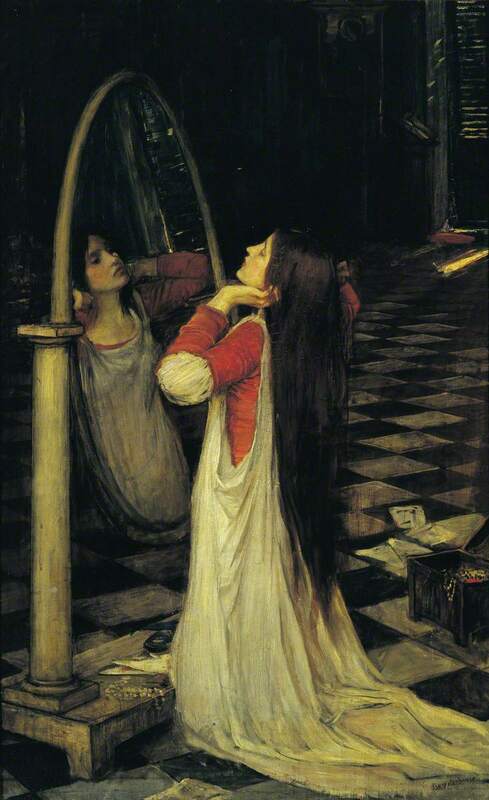 Waterhouse turned to another story made popular in the work of Tennyson, this time drawn from Shakespeare’s Measure for Measure: Mariana in the South is the abandoned fiancée in her ‘moated grange’, who waits in permanent darkness, yearning in front of a large mirror. The study above shows how the artist has moved close to paintings of the Lady of Shalott, and below places Mariana in a pose derived from Millais. Posted in General, Painting and tagged Aestheticism, Alma-Tadema, Bastien-Lepage, myth, narrative, painting, Pre-Raphaelite, Waterhouse. Bookmark the permalink.